The morning of day two at Goddard College my stomach was still a bag of jelly fish. I had slept fitfully through slamming doors, footsteps, ill-fitting sheets and my roomie’s arrival at 2AM. And I woke up at 5AM. I managed to doze until 6:30AM but I was out the door and looking for a place to meet with my journal by 7AM. I questioned how I would be surviving this experience without its sturdy spine to hold me up? As memories of the high school cafeteria sprung to mind, I worried about who’d I’d sit with at breakfast, and despite a crushing need for caffeine I didn’t want to get there too early for fear of seeming too anxious. My Teen was full on. That issue resolved itself very shortly as I found my roommate awake and headed to breakfast. From then on meal times were only a tiny source of anxiety as I met and became friendly with and – by the end of the week positively close – with my fellow IMA-ers (Individualized Masters). By day three I was raring to go. I wanted to get started, have work to do, a direction, a task, a plan. I wrote in my journal, “I finally have some homework!” I was like a clock-work toy, all wound up but with its wheels held still. I wasn’t sure where I was going once let go but I sure was ready to make a dash for somewhere. 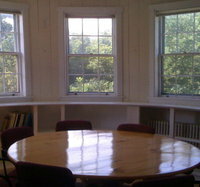 My advising group met in the brilliantly bright Silo room. It was round – naturally – with a round table and round rug. It was a like a hug. Eight women spanning the age-spectrum from late 20s to mid-60s sat around this table every morning to share our thoughts on our process, our fears, our questions, our personal hang-ups and life outside the walls of this womb (was there such a thing?). While inking mandalas, singing or sharing our insta-poetry, we women made a connection. Diverse backgrounds, stages of life, communities and talents blended and sparked inspiration and respect. I felt held up. Supported. Supporting. As a community should. In the small isolated family-unit islands that our society has developed over the centuries, we rarely have the chance to talk with others outside our borders: those who are younger (who wants to try to engage a teenager? ), those who are older and wiser (what do they know about my modern, hectic life? ), or those from completely different living environments or cultures. But the lesson is, these people not only teach you something about life but they teach you something about you and us. We are not so different. We are one. Slightly different glasses, same view. And my biggest lesson? In a room of eight women who share the same number of chromosomes and similar feelings and experiences, I learned I am not alone. This entry was posted in Journaling Techniques & Prompts, Trust the Process (The Goddard Chronicles) and tagged connections, goddard college, women. Bookmark the permalink. sounds invigorating…when we are anxious, when there is chaos, is when we are broken open and ready to accept new directions. 🙂 As much as I dread that feeling of anxiety you talk about, I know that on the other side is achievement (sp?? )…rock on girlie!